The odds to win Super Bowl 54 have been released, and the New England Patriots are currently the favorite to win their seventh Lombardi Trophy in 2020. Super Bowl 53, which saw the Patriots win 13-3 over the Los Angeles Rams in a low-scoring game, took in an estimated $6 billion in total wagers from roughly 1 out of 10 American adults, and of that total, $5.7 billion was wagered at licensed offshore sportsbooks. Our goal is to provide you with only the best betting sites that are both legal, safe, and give you the best value when placing a wager on the point spread, money line, over/under, prop bets, or futures for Super Bowl 54. Is Betting On The Super Bowl Illegal In The United States? No, it is not illegal to bet on the Super Bowl when using a licensed offshore sportsbook. There are no federal laws prohibiting the placing of bets through brick and mortar or online sportsbooks that are operating legally within the industry either domestically or offshore. Bettors in CT and WA are banned from participating in all types of online gambling via state gambling laws. The DOJ Memorandum released on January 14th of 2019 reversing certain parts of the 2011 re-interpretation of the Federal Wire Act could complicate matters regarding domestic betting options. It remains to be seen how this change will affect those states that have already launched state licensed online sportsbooks. Despite the changes taking place, the act of placing a bet on the Super Bowl is not considered illegal in the United States. While there are many online sportsbooks that offer super bowl betting lines, I recommend betting at Bovada. They are one of the most reputable sports betting sites found on the web today. Aside from them being one of the most trusted sites, one of the major attractions for players is the fact that Bovada not only offers sports betting, but they also feature a world class online casino and poker room which can be accessed from one easy betting account. Betting on futures for an NFL team to win next year’s Super Bowl is the first official bet you can make each season. The Patriots and Rams opened as the co-favorites to win Super Bowl 54. 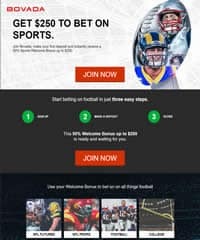 Below you’ll find all the opening odds to win Super Bowl 54 in 2020, so if your betting model shows value then now is the best time to place a wager. Odds provided by Bovada. The odds posted below were taken directly from Bovada Sportsbook during Super Bowl 53 and we’ll post the live odds for Super Bowl 54 when they become available in 2020. Bovada is the most trusted online sportsbook for US players. They are a name you can trust and they always pay. You can view the latest odds and check out their current super bowl promotion by visiting Bovada Sportsbook. Below you will find a video tutorial on how to sign up and bet on the Super Bowl. The overview walks you through the signup process, banking options, bonus options, and then shows you how to bet on the game. Taken from Super Bowl 53, all of this is achieved in 53 seconds, so you can get on to the fun stuff. Each year, the Super Bowl receives the most amount of prop bets out of any sporting event in the country and this year will be no different for the NFL’s biggest game. Sportsbooks go all out on prop specials for the big game and include odds on things such as the length of the national anthem, coin toss result, the appearance of the halftime show performer, the color of the Gatorade shower, whether President Donald Trump will tweet during the game, and dozens more. We will provide you with the prop bets for Super Bowl 54 when they are made available. Below are some of the prop bets for Super Bowl 53 provided by the Bovada sportsbook. WILL STATE REGULATED SUPER BOWL BETTING EVER BE LEGAL IN ALL 50 STATES? If you had asked this question about betting on Super Bowl 52 in early 2018, we would have probably told you that it is possible but will be a long time coming. Since PASPA's repeal in May 2018, many states have started to legalize domestic sports betting and several states have already begun accepting bets. As far as all 50 states, it is possible, not likely, but we do expect to see many more states enact domestic sports betting laws in 2019 and 2020. Below is an updated list for states that don't have any laws against online gambling. How Can I Bet On Super Bowl 54? Bettors can place wagers on Super Bowl 54 in multiple ways. We recommend using the licensed offshore sportsbooks listed on this page because they host a variety of bets including the point spread, money line, totals (over/under), props, futures, and parlays. Who Is Expected To Win Super Bowl 54? The Patriots are currently favored to win Super Bowl 54 following their 13-3 victory over the Rams in Super Bowl 53. Can I Place Live In-Game Bets During Super Bowl 54? Yes. Once kickoff occurs and all the standard betting lines are closed, the game will move into live betting. For those who are not aware, live betting is when you place a wager during regulation or overtime of a sporting event. These types of lines are time sensitive and often feature higher payouts. Live football betting is interesting because the wagers will change per quarter. For example, in Super Bowl 51, when the Patriots were down 28-3 at halftime, anyone who placed a bet on the Patriots to win came up huge based on the odds. You can also find live prop bets. Live betting comes with its own rules apart from the standard betting lines. You can find these rules within the live betting section of the sportsbook. Since live wagers are typically based on specific occurrences, the rules lay out the guidelines and conditions for those occurrences in order for the bet to successfully hit. 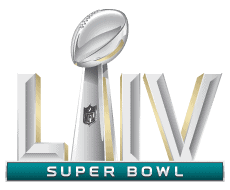 Fans who want to stay up to date about this year's Superbowl can visit the NFL official Super Bowl website. Or check out our article on interesting Superbowl facts to gain insight into things like how much money is spent on the Superbowl each year.